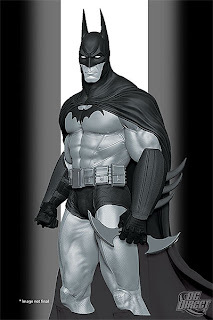 Current holder of the Guinness Book of World Record for "Most Critically Acclaimed Superhero Game Ever," Batman Arkham Asylum has inspired this Batman black & white statue from DC Direct. I have to say Batman is looking pretty sweet. Batarang in hand and all. On sale September 1, 2010 for $80.00 is based on the video game design and measures approximately 7.25" high x 6.25" wide x 4.75" deep, is painted in monochromatic tones, features a Bat-logo shaped base and is packaged in a black and white box. Why does it take so long for this stuff to come out?